Home inspection is an exciting and rewarding profession that provides virtually unlimited career opportunities to inspectors with the right credentials. The best way to receive the training needed to become a certified home inspector is through Inspection Certification Associates’ Home Inspector Online Training Course. To learn more about life as a professional home inspector, check below for an overview of the types of tools and equipment you’ll be using to conduct inspections once you’re ICA-certified. The International Association of Certified Home Inspectors (InterNACHI) Standards of Practice call for home inspectors to carry a flashlight and an electrical circuit tester for testing ground-fault circuit interrupter (GFCI) devices. Theoretically, that’s all that’s needed to carry out home inspections. Practically speaking, however, there’s other equipment inspectors need to safely and thoroughly conduct home inspections. Home inspectors often need to access areas containing airborne particulates that can be hazardous if inhaled, including asbestos, carcinogens and other biologically harmful materials. In many of these situations, disposable face masks are ineffective. Although they’re somewhat uncomfortable (especially in hot weather), it’s important for inspectors to include a half- or full-face respirator in his or her toolkit. Since some organisms can enter the body through the eyes’ mucus membranes, full face respirators are recommended. At the lower end of the spectrum are basic electrical circuit testers costing about $12, which reveal ground faults in 120- but not 240-volt circuits. Basic circuit testers, however, won’t detect defects in arc-fault circuit interrupters found in many newer homes. Some inspectors also carry arc-fault circuit interrupters, or AFCI testers, to check that arc-fault interrupters are working properly. A dependable AFCI tester costs around $170. There are also AFCI/GFCI testers that are used to check if both types of circuit interrupters are working properly. Becayse they are higher-end, they cost about $250. Voltage indicators are used to see if electrical current is flowing through a circuit or device. Their accuracy is limited, since they sometimes give false positive readings from static electricity even though there’s no house current present. Electrical testers are capable of detecting both 120- and 240-volt current. Inspectors find them useful for checking clothes dryer receptacles when there’s no dryer in the home at the time of the inspection. Combustible gas detectors are used to detect the presence of flammable gasses leaking from pipes, tanks or gas-operated equipment. Some inspectors simply rely on their noses, since natural gas and propane—the two most common types of combustible gasses—have odors that are easily detectable. Prices of combustible gas detectors range from less than $100 to more than $1,500. Moisture meters are carried by most home inspectors. The two types are search meters and measure meters. Search meters detect excessive levels of moisture (but not the amount) beneath or behind various materials, such as vinyl or ceramic tile. Search meters can also help find leaks beneath shower enclosures and bathroom floors. Once moisture’s been detected, measure meters determine the amount. They work by touching the meter’s two electrodes to the area where there’s moisture, which measures the resistance in ohms. The measured resistance shows the percentage of moisture, which is displayed on the meter’s readout screen. Carbon monoxide analyzers are used to determine the amount of carbon monoxide (CO) emitted by water heaters, boilers, furnaces and other gas-operated appliances. CO is tasteless, odorless, highly toxic and can be fatal if built up in the body over time. The presence of excessive CO levels can result from appliances operating inefficiently, which means they need servicing or replacing. Improper venting can also cause unsafe carbon monoxide levels. Digital infrared thermometers are used to check temperatures of household heating and cooling equipment, including hot water heaters, registers and refrigerators. They’re also used to read the temperature of circuit breakers and other electrical equipment. Digital thermometers work by emitting an infrared beam that reads the temperature of an object, which is then displayed on the device’s readout. Most home inspectors carry an infrared thermometer. Continuous radon monitors are used to test for the presence of radon, a colorless and odorless radioactive gas that’s thought to be a leading cause of lung cancer in patients who are exposed to high doses over long periods of time. Radon is found in virtually all soil, and can seep into a house through pores in concrete foundations or gaps in floors and walls. Some areas have very little radon, while others have high concentrations. Continuous radon monitors sample the air hourly for a minimum of 48 hours, after which the monitor displays the average level of all samples taken. Infrared cameras use infrared rays to capture images in much the same way as regular digital cameras use visible light. Variations in temperature appear as different colors, which lets the inspector identify areas that are unusually hot or cold. An example would be an infrared image that shows a wall that’s colder at the top, indicating a settling of the insulation within the wall. Some inspectors offer infrared imagery as an additional service. You’ll learn all about that in the ICA thermal imaging course. Spectoscopes allow roofs to be inspected without leaving the ground. A wireless camera is connected to an Android or iOS smartphone or tablet, then the Spectoscope’s pole is extended so the inspector can capture and store digital images of the rooftop to review later. Telescoping ladders can easily be carried in the trunk of a car when collapsed. They can also be carried through houses without bumping into and damaging walls or furniture. They are, however, more dangerous than other types of ladders, since it’s difficult to see if their locking mechanisms are fully engaged. Articulating ladders can also fit in the trunk of most cars. Articulating ladders are versatile and offer the best of both worlds, since they can be used as either stepladders or extension ladders. They can also be used as trestle ladders, scaffolds or work tables. Flashlights are one of the two pieces home inspectors are required to carry under InterNACHI Standards of Practice. Powerful flashlights are useful for inspecting areas that are dark or very dimly lit, but the strong reflections they create can make it difficult to take photos. It’s a good idea to always carry a small backup flashlight, since unexpectedly losing the primary light can be dangerous if the inspector is left in the dark. Microwave testing devices are inexpensive devices that, while not about to read microwave levels, can indicate whether the magnetron that powers the oven is working properly. Telescoping magnets are compact devices used to retrieve accidentally dropped screws, small tools and other metallic items from hard to reach places. Some telescoping magnets are capable of lifting objects weighing five pounds or more. Telescopic inspection mirrors are another small and inexpensive item that come in handy for examining areas with limited accessibility. Some are equipped with small LED lights for use in dim light. Safety glasses offer eye protection in situations where an inspector’s vision may be at risk, such as checking attics and crawlspaces with protruding fasteners or wires. Short circuits in electrical panels can also emit eye-endangering sparks or debris. Costing around $10, most home inspectors routinely carry a pair. Smoke pens are used to show air movement and flow patterns. They check furnaces and other fuel-operated appliances for backdrafts that could pull toxic exhaust out of a vent and into a house’s living area, endangering the lives of its occupants. Electrical safety gloves are non-conductive liners worn under insulating rubber gloves covered by protective leather gloves. InterNACHI recommends home inspectors only wear electrical gloves that meet American Society for Testing and Materials (ASTM) D-120/EIC903 specifications. Roof boots with high-traction replaceable soles help protect against slips and falls when inspecting rooftops, particularly in damp weather. Compasses are sometimes used by home inspectors to determine the direction of a home’s position in relation to the sun, which is useful if the home has solar panels or other energy-saving features. Basic compasses cost just a few dollars. Tool vests provide a convenient and inexpensive means of carrying tools during inspections. Vests also allow inspectors to work hands-free while giving them ready access to flashlights, mirrors, meters and other small pieces of equipment. 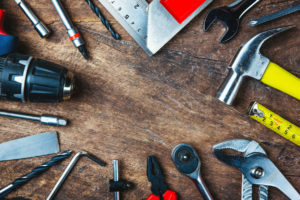 These are just some of the tools typically used by home inspectors. Equipment can vary with the local climate, types of inspections and personal preference. Home Inspection Report Software is included in your tuition. You’ll also receive Report Form Pro 2 home inspection reporting software. Compatible with both iOS and Android devices, Report Form Pro 2 lets inspectors generate inspection results directly from a mobile phone. A $400 value if purchased separately, the software is free to ICA students. Unlike other schools, ICA’s training is all inclusive. We’ll also train and certify you to conduct mold and radon inspections, for which clients typically pay extra. You’ll also have free unlimited access to our library of home inspection e-books and other reference materials. When you select ICA, all this and more is included at one low price! To get started, enroll online or call us at 888-374-4096—you’ll be glad you did!